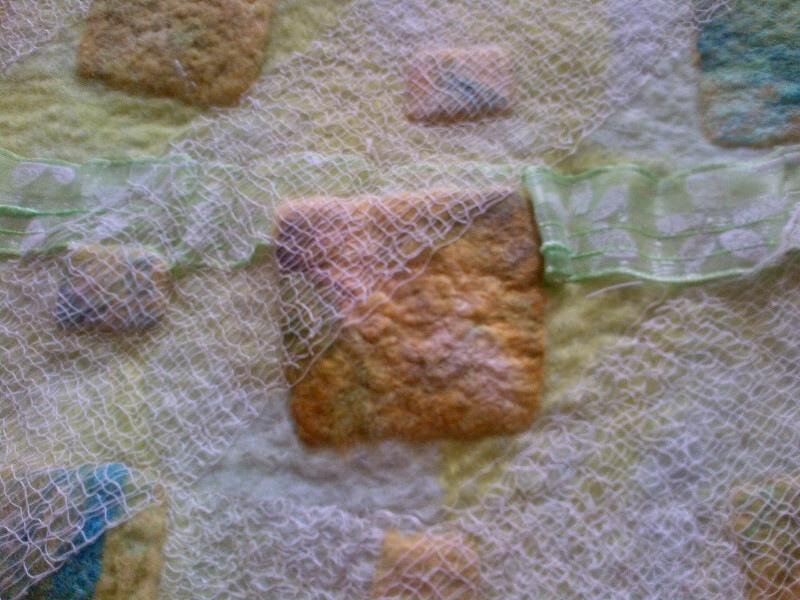 This is my second experiment with gauzy ribbon and scrim. Possibly one that I won’t repeat. Scrim in this context is a very light gauzy material made usually of cotton or flax or jute which is opaque in effect. I believe it is used for reinforcement e.g. In book-binding and plastering. I’ve never felted it before and as it will immediately lose its stiffness during the wet-felt stage, I wanted to see what happens. 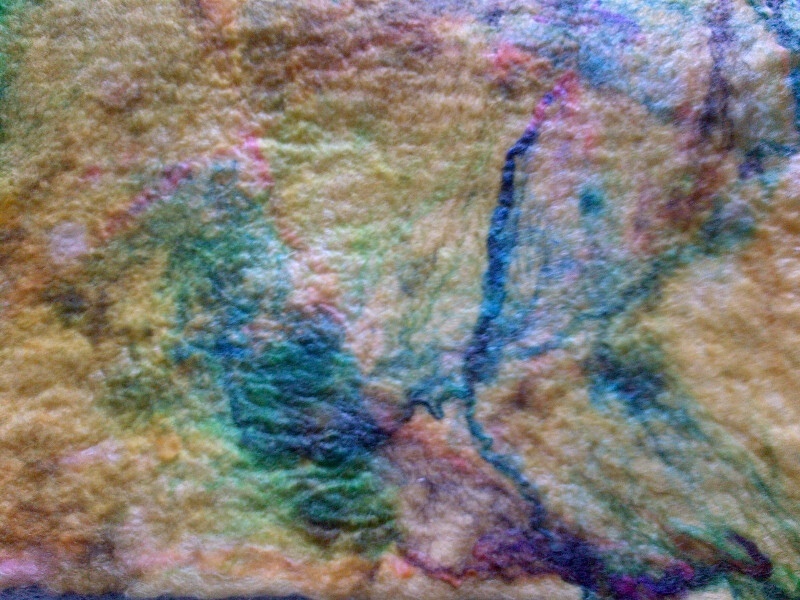 First I made a pre-felt with hand dyed silkworm silk applied to the surface. I cut the pre-felt into squares. Then I laid out my felt with striped ribbon, scrim and the pre-felts. 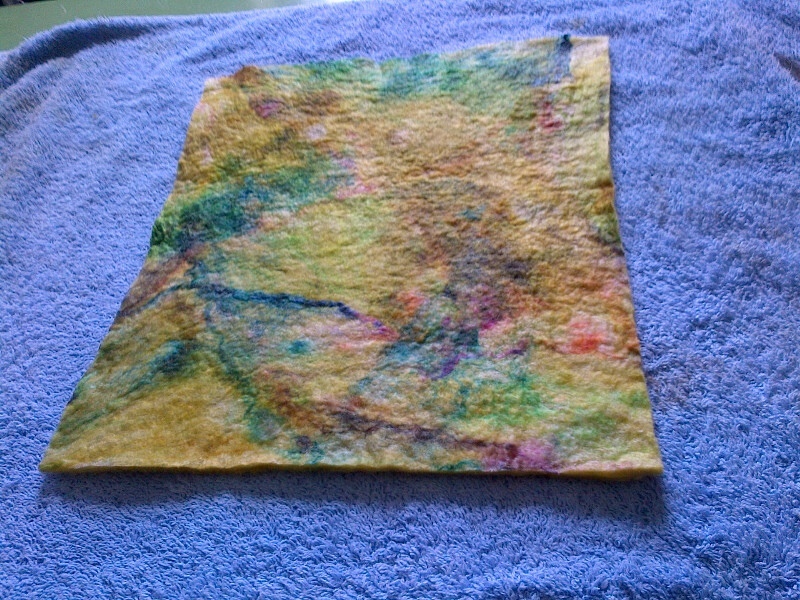 I added some more scrim cross-wise half way through the felting process. This is the result. It started quite large but got smaller and smaller as frustratedly I cut off edge bits of scrim which broke up. 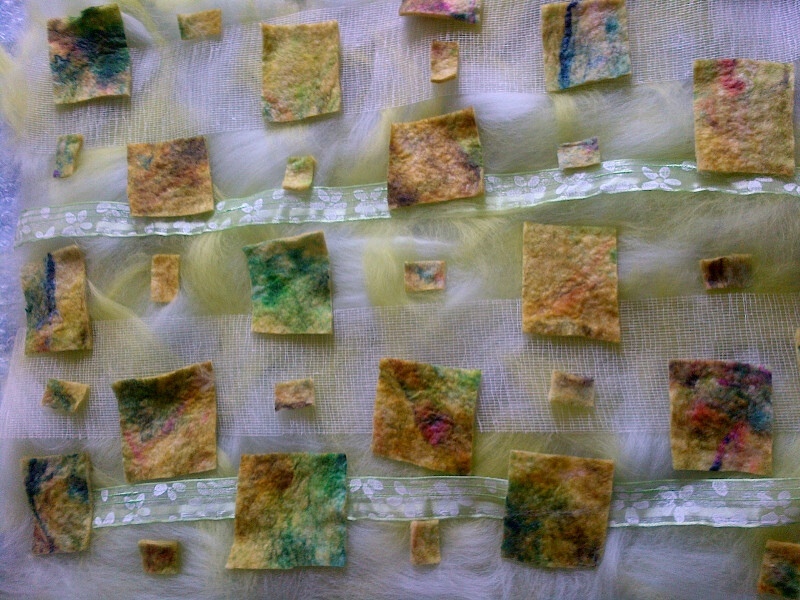 I use those cotton gauze squares from Boots, I love the way it sinks into the wool and becomes part of the whole thing, almost invisible but altering it and adding an interesting wavy texture. Thanks. I’ve sent something to your hotmail account if you can take a look. This entry was posted on 05/06/2013 by Themidlandperfumer in arts and crafts, craft, crafts and crafting, creative process, felting, nuno, textiles and tagged felt, felting, Gauze, gauzy ribbon, merino tops, net, nuno, ribbon, scrim, silk, textiles, wet felt.